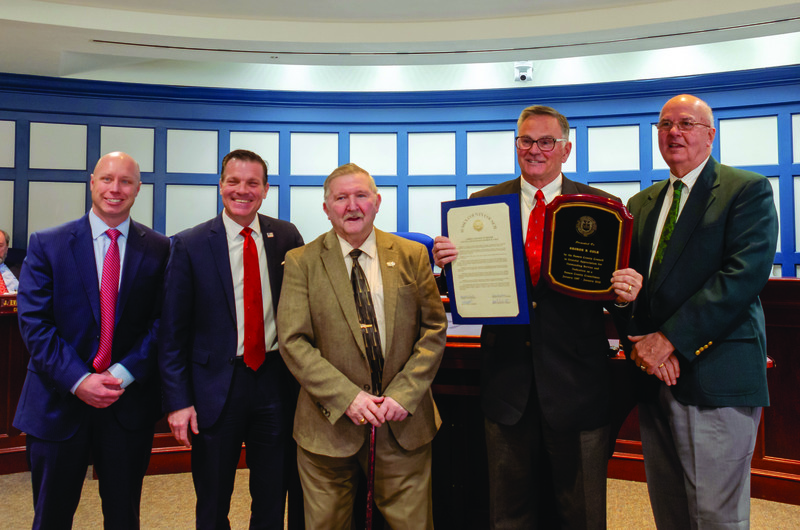 Tuesday, Dec. 11, was the last day on the dais for Sussex County Councilmen George Cole and Rob Arlett. Cole, a Sussex County native elected to the council in 1986, is its longest-serving member in the modern era. His family has a history of serving the people of Sussex County, as his father, Charlie Cole, was elected to serve on the council in 1974. His mother, Kitty, was appointed to the council in 1985, upon Charlie Cole’s passing. While Cole said he flirted with the idea of not running for council for a few election cycles, he made the decision to end his reign and not run in the 2018 election. “As Bob Hope used to say, ‘Thanks for the memories!’” said Cole on his final day serving on council. Rob Arlett, who was born in Rhode Island but grew up in California, moved to Delaware in 2005. He was elected to represent District 5 in 2014. He chose to not run for re-election this year, and instead sought the office of U.S. senator. While the Republican received 37.81 percent of votes, he was beat in that race by incumbent U.S. Sen. Tom Carper, a Democrat. Arlett thanked God and his wife, and noted that holding office was not one of his life goals. Cole said that, while it may sound funny, serving on County Council was the only job he’d had where he didn’t work for himself. “I was always so proud to hear when the County did something right,” he said. County Attorney J. Everette Moore said that, looking around the room, he could easily say he’s worked with Cole longer than anyone else. Council President Michael H. Vincent said he had offered to have Cole chair his last meeting; however, Cole chose not to, so as to be able to speak a little more freely. “George cares about this county, the people of the county, and everything he’s done he’s tried to do, in his mind, was the right thing to do,” said Vincent. “I consider George a friend, and that’s a valuable thing to have. Sussex County EMS Director Bob Stewart presented Cole with a personalized fleece and hat. “Twenty-eight years ago this coming January, our paramedics service started right here in Georgetown,” said Stewart. “George is the last sitting councilman who was here when we opened for business. Former administrators and council members also spoke, including Dave Baker, Bob Stickles, Dale Dukes and Lynn Rogers. Georgetown attorney Robert Witsil wrote an ode in honor of Cole’s departure, ending the afternoon’s tribute. We can’t thank you enough in this little ditty. Though I’m sure we’re quite blurring, what given your sight. All of whom declare, ‘Happy Retirement’ to you.